A project to unify a variety of adhesive products such as glues and tapes which have been produced under different brands. 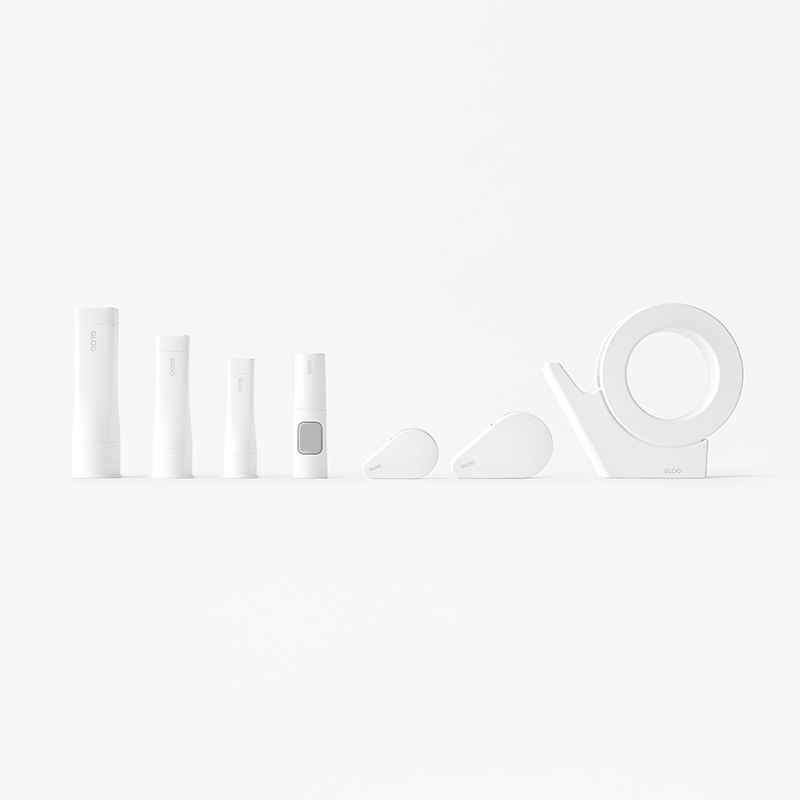 The new products were developed to solve subtle stresses that have been extracted from examining users of current products, with questions like “ where is the cap placed when it’s off from the product?” or “is the current shape really easy to hold and carry?”. The main body of the products were finished in matte white and the logo and other information were printed in small font with medium contrast so that it won’t be unnecessarily informative on the desk. Moreover, as a rule across all the products, colours used as an accent represent their functions, such as “grey = standard”, “red = strong adhesion” and “light blue = re-stickable”. The package design also deployed these colours, along with pictograms with brief explanatory texts, as a simple yet careful communication method and avoided excessively stimulating expressions in previous packages. Wishing to share joy and excitement of smooth and convenient pasting activity, symbols representing the “pasting process” was placed on the top right of the logo and the package. A square-shaped glue stick that can be easily applied to the corner edges of paper. The square profile makes it less likely to roll off the desk and the knob to squeeze out the glue is easier to be held, compared to conventional glue sticks with cylindrical shape. As for a square cap was found to have low sealability, a unique round cap was developed to overcome this issue. The inside of the round cap has a cavity inside in order to prevent the spilled glue from hardening, which often makes the glue difficult to be opened, and the large rim enables the cap to be handled with only one hand. The stick can be placed with the cap side down, and after pasting, the body can be easily clicked on to the cap with one hand. A tape glue with compact head that can be swung into the body when being carried. The lid slides and covers the head part when closed, which prevents loss of the cap and dirt invasion to the adhesive surface. The head was designed to stop at two angles, which enables two different ways of gripping, as for there are two popular ways to grip the product; holding with index finger pressing to the body or grab the tape with the whole hand. Additionally, unique mechanism of dots pasting secured both a sharp cut of glue and strong adhesion. An instant glue with red colour that clarifies pasted area and fades after 15 minutes. The cap deploys a round-square shape to be opened easily and not to roll around, and double walls of the cap ensure superior sealing, while black interior wall of the cap cuts off lights and protects the glue colour from fading. It can be attached to the bottom of the body, which prevents the cap from being lost and improves the holding experience. Once docked on the bottom tip, the cap makes the glue stand on the desk, which prevents glue liquid leaking while in use. Finally, for both “dot” and “line” pasting, the nozzle tip was shaped as if it was cut diagonally. The body of the tape dispenser was made as light as possible to carry and to prevent injury and damage from dropping. For easy one-hand use, a suction disc of silicon resin was attached to the bottom. With this disk, supported by hidden vent inside, the tape dispenser can “stick” itself on to the desk when put on the surface, and when pulled upward, it can automatically “detach” itself, enabling all these motions to be completed with only one hand. And of course, the basic performance was also improved with, for example, a specially processed fine blade that cuts straight lines smoothly. 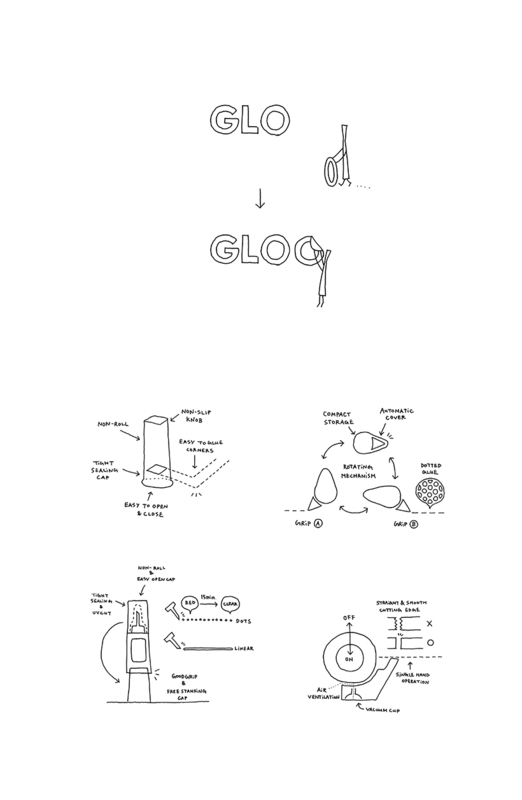 The first collection consists of four products and they are combined into “GLOO BOX” as for limited edition. 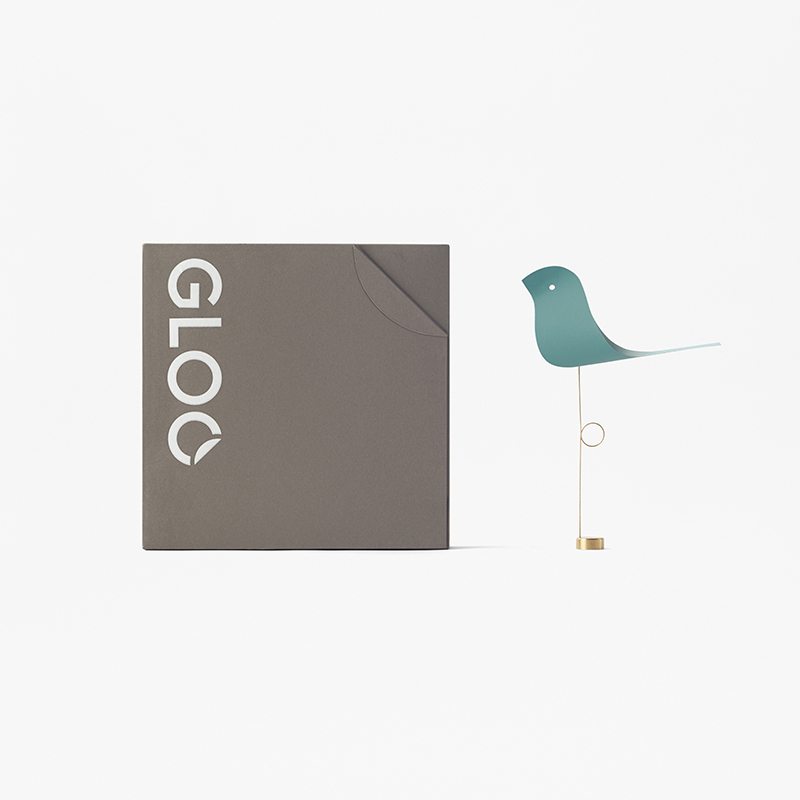 The box includes a bird-shaped paper mobile object that stabilizes on to desks, but sways when being hanged on a shelf. It can be crafted up by using all four items, which guides users to experience four product with fun.